In just a short phrase, John says, “he went…across the brook Kidron”. This short phrase is loaded with meaning. The Kidron valley is the steep valley that borders Jerusalem on the east. Jesus had celebrated the Passover meal with his disciples in the “upper room” on the Western Hill of Jerusalem (see here). He then walked with them across the entire city of Jerusalem, passing the temple (see here), and exiting the city on the eastern side. Their destination, on the opposite side of the Kidron valley, was the Mount of Olives. Jerusalem citizens were not allowed to have gardens within the city limits, but very wealthy would have gardens in the outlying areas, such as the Mount of Olives . There was apparently a wealthy landowner in Jerusalem who had given Jesus access to his private garden. Jesus would often stay there with his disciples (John 18:2; see also John 8:1-2). Jesus has left the city of Jerusalem behind him. The Jewish leaders have been unable to kill Him because of the large crowds (see Matthew 26:5; Mark 14:2), but he is now away from these crowds. Jesus is now in danger. Also, this same brook Kidron was the scene of another famous crossing in Israel’s history. King David had also crossed this valley when he fled from his son Absalom’s conspiracy. David also had been rejected by his own family and betrayed by a close friend (2 Samuel 15). Gethsemane means, “oil press”. 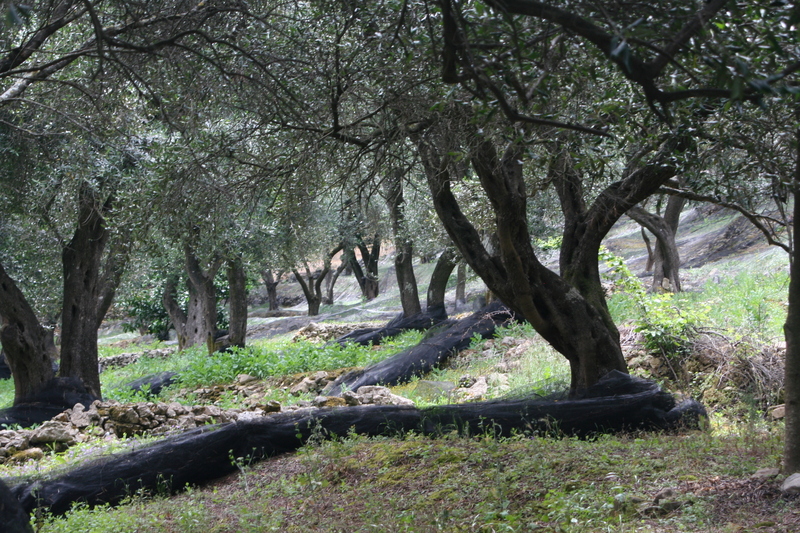 This was the garden of the oil press, no doubt in relation to present olive trees. Jesus then placed eight of his disciples and instructed them to wait and to pray. Luke’s account tells us that they were to pray that they do not enter temptation. This would be a night of terrible struggle for them, for their leaders, and for their Lord. Jesus took his three closest disciples deeper into the garden. Peter, James, and John were to be with Him during His time of anguish. Jesus sought out his closest companions to be with him during his most difficult time. Jesus was very sorrowful and troubled. As the prospect of the cross grew near, Jesus was very alarmed. The very thought horrified him! He was “in the grip of horror” . The horror was so intense that it nearly killed him! The “cup” is the symbol of God’s wrath throughout scripture. We are told that the wicked will drink the cup of God’s judgement (Psalm 11:6; Psalm 75:8; Isaiah 51:17,22; Jeremiah 25:15-28; Revelation 14:10; Revelation 16:19). This is not the eloquent prayer of John 17. Jesus is facing the prospect of taking the guilt for all of the sins of the world. He will take every filthy, vile, perverse thing that we have ever done. God the Father will turn his back on him, severing the eternal bond that had never been broken. Jesus faces this event and is horrified! It was customary for a man to stand in prayer, but Jesus is brought to his knees. We are told that he fell on the ground repeatedly. He drops to his knees, then falls down. He picks himself up only to fall down again. Luke’s account tells more about the stress, the horror, and the crushing weight on Jesus Christ in the garden. God the Father sent an angel to strengthen him. There is only one other recorded time that Jesus needed angels to keep Him alive — that was after he had fasted in the desert for 40 days (Matthew 4:11; Mark 1:13). The stress of the cross nearly killed Him! His sweat became like great drops of blood. There is a rare phenomenon, called hematidrosis, where extreme stress can cause the blood vessels under the skin to burst, thereby mixing blood with sweat. Jesus may have still had blood on his face from the intensity of the struggle. He returns to Peter, James, and John after about an hour and finds them sleeping. All of the disciples were sleeping, but Jesus directed the primary reprimand to Peter. This may have been because Peter was the most outspoken of the disciples, and had vowed twice that he would never leave Him. Luke’s account says that they were “sleeping from sorrow”. The emotions and the tragedies of the day had taken their toll, and they could no longer stay focused. They fell asleep from their sorrow. Jesus warned them with a command, “watch and pray”. They need to be vigilant because the enemy is near. He also knows that their own strength is no match for the enemy who is against them. And again he went away and prayed, saying the same words. And again he came and found them sleeping, for their eyes were very heavy, and they did not know what to answer him. Jesus returned to his conflict in prayer for a second time. But this time, we see in his prayer, “your will be done”. These words show that he accepted that this is the Father’s will and was preparing to finish it. He returned to the disciples a second time and found them sleeping again. This time, there is no record that Jesus woke them up. So, leaving them again, he went away and prayed for the third time, saying the same words again. Jesus went back and prayed a third time. There are many parallels between Jesus’ struggle in the garden and His temptation at the beginning of his ministry. Both occasions brought him so near to death that he needed help from angels. Both occasions have a threefold conflict, and on both occasions, Jesus Christ emerges victorious. Then He came to the disciples and said to them, “Are you still sleeping and resting? Behold, the hour is at hand and the Son of Man is being betrayed into the hands of sinners. The time of prayer was over. It was time to wake up the disciples and be going. Jesus knew that Judas was coming with the soldiers.